3D reconstruction technology include tools that provide a three dimensional framework/prototype of the specific operation or product. These designing tools help project managers, site engineers as well as site laborers to clearly understand the product/ operation in a virtualized environment so that during the actual work process, the risk of error can be minimized and total cost of production can be optimized. 3D reconstruction technology combines traditional computer aided design (CAD) and 3D modelling in order to design, visualize, and simulate digital representation of the physical and functional characteristics of a structure over its life cycle. These tools and services are widely used in various industry verticals including healthcare, manufacturing, retail, and oil and gas. TMR believes that 3D scanning based 3D reconstruction technology type is expected to grow at an exponential rate from the year 2019. The reason for this is growing application of 3D scanning based technology in autonomous vehicles. Demand for 3D scanning technology is expected to surge due to increase in the number of autonomous vehicle projects around the globe. More and more automotive manufacturers are deploying this technology since 3D scanning helps in accurate 3D depth measurement for autonomous vehicles. The major application area of 3D reconstruction technology is expected to be gaming and entertainment. The use of 3D reconstruction technology is growing due to the increased use of 3D animation in mobile applications, games, and movies around the globe. Medical is expected to be the second most attractive application segment for 3D reconstruction technology by 2027. In medical application, 3D reconstruction technology is used for medical image analysis. In addition, it offers improved accuracy due to multi view aggregation and helps to plan, simulate, and guide medical procedures. Civil engineering is also an important application area of 3D reconstruction technology and it is expected to grow at a CAGR of 7.3% during the forecast period, 2019-2027. The healthcare industry segment is expected to create substantial incremental opportunity in the 3D reconstruction technology market over the forecast period. 3D reconstruction technology is used for medical imaging processes. Medical imaging provides diagnosis of cardiovascular disorders, cancer, neurologicaldisorders, gynecological issues, and other conditions. Based on geography, the global 3D reconstruction technology market has been divided into North America, South America, Europe, Asia Pacific, and Middle East & Africa. Europe is expected to hold a prominent share and account for more than 35% of the global market by 2027, followed by North America. Government initiatives for preservation of cultural heritage is the driving factor for the 3D reconstruction technology market in Europe. Germany holds the larger market share in the Europe region. Europe is followed by North America that is estimated to hold more than 30% share in the overall market in the year 2019. The market in Asia Pacific is expected to grow at a faster rate globally due to adoption of 3D reconstruction technology in the construction industry. Big construction companies are using 3D reconstruction technology, for instance, CCFEB Civil Engineering Ltd., a subsidiary of China State Construction Engineering Corporation (CSCEC), which is China’s largest construction and real estate company has adopted 3D reconstruction technology techniques. The Middle East is also a prominent contributor to the growth of the market. Some of the key markets in the Middle East are Saudi Arabia and UAE. Major players operating in the global 3D reconstruction technology are Acute3D, Agisoft PhotoScan, Autodesk, Blackboxcv, Elcovision, Photometrix, PhotoModeler, Pix4D, RealityCapture, Realsense (Intel), Skyline Software Systems, and Vi3Dim Technologies. These players are continuously focusing on R&D activity in order to provide the most efficient and affordable solutions to oil and gas companies. The 3D reconstruction technology market report provides analysis for the period 2016–2027, wherein the period from 2019 to 2027 is the forecast period and 2017 is the base year. The report covers all the major technologies and trends playing a significant role in the market’s growth over the prognosis period. It also highlights the market dynamics, which comprise drivers, restraints, and opportunities, and along with it the impact analysis of the drivers on the market is also provided. The study provides a complete outlook on the evolution of the global 3D reconstruction technology market throughout the above mentioned forecast period in terms of revenue (US$ Mn). The market overview section of the report demonstrates market dynamics such as drivers, restraints, and opportunities that influence the current nature and future status of this market apart from challenges of the market. The market overview section also includes pricing model, which includes analysis of pay-per-unit, and tiered pay-per transaction model offered by 3D reconstruction technology vendors. In addition, market attractiveness analysis has been provided for every segment in the report for all the regions, in order to provide a detailed understanding of the overall scenario in the 3D reconstruction technology market. The report also provides an overview of various strategies adopted by key players present in the market. The report also highlights the competitive landscape of the global 3D reconstruction technology market, positioning all the major players according to their presence in different regions of the world and initiated by them in the 3D reconstruction technology market. The complete 3D reconstruction technology market estimates are the result of our in-depth secondary research, primary interviews, and in-house expert panel reviews. 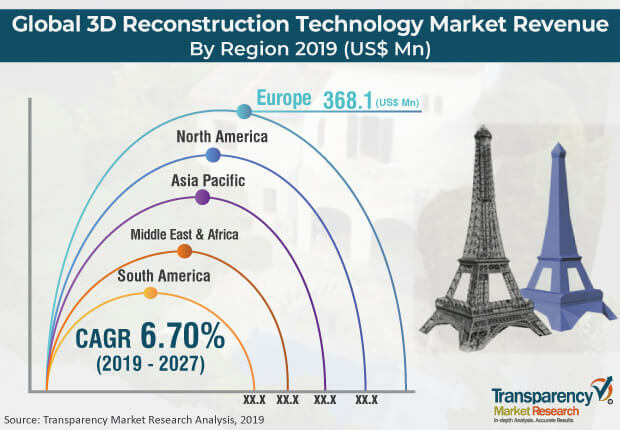 These market estimates have been analyzed by taking into account the impact of different political, social, economic, and technological factors along with the current market dynamics affecting the 3D reconstruction technology market growth. This report provides all the essential information required to understand the key developments in the 3D reconstruction technology market and growth trends of each segment and region. It also includes companies’ strategies, business overview, and business portfolio and financial information, under the company profile section. Furthermore, Porter’s Five Forces analysis explains the five forces namely buyers bargaining power, suppliers bargaining power, threat of new entrants, threat of substitutes, and degree of competition in the3D reconstruction technology market.This report also provides a comprehensive ecosystem analysis of the 3D reconstruction technology market. It explains the various participants, including software & platform vendors, system integrators, intermediaries, and end-users within the ecosystem of the market. Moreover, various rules and regulations associated with the particular market are also specified according to different regions. The research methodology is a perfect combination of primary research, secondary research, and expert panel reviews. Secondary research sources such as annual reports, company websites, broker reports, financial reports, SEC filings and investor presentations, national government documents, internal and external proprietary databases, relevant patent,statistical databases and regulatory databases, market reports, government publications, statistical databases, World Bank database, and industry white papers are referred. Primary research involves telephonic interviews, e-mail interactions, and face-to-face interviews for detailed and unbiased reviews on the 3D Reconstruction Technology market, across geographies. Primary interviews are usually conducted on an ongoing basis with industry experts and participants in order to get latest market understandings and authenticate the existing data and analysis. Primary interviews offer firsthand information on important factors such as market trends, market size, competitive landscape,growth trends, outlook etc. These factors help to validate and strengthen secondary research findings and also help to develop the analysis team’s expertise and market understanding. Moreover, the data collected and analyzed from secondary and primary research is again discussed and examined by our expert panel. The research study includes profiles of leading companies operating in the global 3D reconstruction technology market. key players profiled in the 3D reconstruction technology market include Acute3D, Autodesk, Blackboxcv, Elcovision, Photometrix, PhotoModeler, Pix4D, Reality Capture, Realsense (Intel), Skyline Software Systems, Vi3Dim Technologies, and Agisoft PhotoScan.